The child develops fine motor skills and eye-hand coordination with activities in pouring, scooping, tonging, tweezing, polishing, folding, stringing/sewing, actual food preparation and flower arranging. 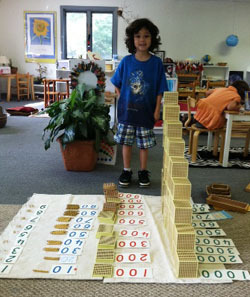 Montessori materials are pleasing to the senses. The materials encourage exploration and discovery. This area enables the child to order, classify, match and grade relating to length, width, diameter, sound, color, pitch and taste. This provides the foundation for the development of memory, reasoning and a creative imagination. This area makes use of unique, hands-on Montessori materials. Children are given the opportunity to explore mathematics from the concrete to the abstract, making math enjoyable and understandable. Concepts of quantity, number, symbol, sequence and operations build on each other in incremental difficulty as a natural progression to understanding. Throughout the entire Montessori environment, a child is hearing rich language. They are learning the names of geometric shapes, artists, parts of animals & plants, geography, parts of speech and so much more! There is wonderful poetry, storytelling, songs and our unique Literacy Bag Program. Children are introduced to letter sounds using sandpaper letters. This progresses to the desire to want to read and write. In Montessori, there is a true connection between the indoor and outdoor world. Outside experiences and exploration are easily connected to the child’s indoor activities that expose them to geography, history, botany, animal classes, physical and natural sciences. Our “Hands on Nature”, Director, offers outdoor nature activities and classes. The arts are viewed as integral components in the Montessori Curriculum. They are part of the everyday activities of the children. Art is open-ended, appreciating the process rather than the product. Every child’s art is their creation. Our, “Artist in Residence,” offers wonderful multi-cultural music, various instruments and African drumming. Singing, dancing and instruments are in the classroom every day. Namaste, from our Yoga Instructor. Classes are offered in the Fall & Spring so we can have yoga outdoors on our beautiful school grounds. STEAM has been integrated into the Montessori Curriculum for over 100 years. The NMS staff are highly qualified Early Childhood Developmental Specialists who have been carefully selected based on their knowledge, experience, and understanding of children. The teachers are skillful observers and therefore know each child’s developmental progress. A Montessori Certification is a Graduate Level Training Program that is extensive, intense and proven successful by over 100 years of scientific observation and research.